The excavation at Great Park Wood contiues on 11 May 2019. The site is at TQ 8523 1903 on the NW corner of Great Park Wood - nearest post code TN31 6BG. Parking is at a field gate south side of B2089 about 1km W of Udimore and about 200m W of the dig site. We have had a gate put in from the field to the dig site so walk across the same field where the cars are parked. Bob Turgoose is organising the dig and Simon Stephens is the archaeologist in charge. Wellingtons are highly recommended as the field track is very muddy in places. Bring a spade, trowel (builders type), kneeling pad, sieve if you have one and lunch. If the weather looks bad check with Bob on 01424 882657 that it is still on. We will be visiting a mixture of sites in South Wales the weekend after Easter with an emphasis, but not exclusively, on tinplate production including visiting a 'modern' continuous coating plant, Tata Steel Trostre, in Llanelli which also has a small museum on site. The plant visit will be from 3pm on Friday 26 April to give time to travel down. Other sites to visit will be the remains of a tinplate works at Aberdulais, Neath owned by the National Trust (bring your card if a member for free entry) and a preserved tinplate works at Kidwelly, if I can get them to open it for us as it has restricted opening times. Once we are all 'plated out' we will visit 19C works in Merthyr Tydfil and possible a return visit to Blaenavon for those who did not make the Forest of Dean trip or would like to see the works again. Alternatively, 'The Big Pit' is nearby which includes an underground tour for anyone wishing to look at South Wales' coal heritage. Expressions of interest to Tim Smith, secretary@wealdeniron.org.uk or Tel 01403 710148 The detailed programme is presently being put together. Numbers will be limited to about 12. Following the discovery of a new bloomery site and slag in the stream on 12 January we will be returning to Newick Wood in search of the source of the slag found in the stream and also to reassess what appeared to be a bay across the gill. Access will be via footpaths from Broad Oak which straddles the A265 Burwash Road just east of Heathfield. The footpath starts at TQ 60047 22196 the west end of Street End Road. Hopefully we will be able to park in Street End Road which is a fork to the north off the A265. Failing that, park at the Village hall which is on the south side of the A265 and use the footpath through to Street End Road. Note the terrain is steep and rough in places. Bring lunch, probes and wellington boots are advised. Should the weather be wet on the day please contact Tim Smith 01403 710148 by 08-30am to check the event is still on. The proposed foray to hunt for the bloomery at Tudeley is postponed as the stream is too high to investigate. Instead we will be re-examining bloomery sites in Newick Wood as we think there is an error in the location in the record. Meet in Newick Lane, Heathfield at TQ595 234 at 11 am where we will be able to park cars inside the gate. which is located immediately after a power line (if travelling North) which crosses Newick Lane. (Newick Lane is the second turning left as you leave Heathfield travelling East on the A265). Bring probes, stout footware / Wellingtons and lunch. Visit To Tudeley in January postponed due to site conditions Date to be confirmed. Field Group members will be circulated. At the invitation of HAARG we will be looking for the Conster Manor Bloomery, Beckley. Straker reports bloomery slag in the bay of a farm pond at Conster Manor Farm, Beckley but this was probably brought to the site to construct the bay so we hope to find the site of the bloomery furnace. A foray includes field walking to identify possible iron-working sites. In favourable cases, this is followed up by excavation to further explore the layout of the site and to find dating evidence. View a short VIDEO of a Foray (16Mb) - it may take a while to download. Visit museums with displays devoted to Wealden Iron. 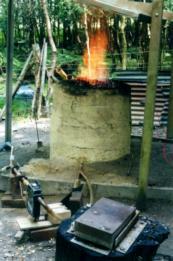 A study of a forge and furnace site.